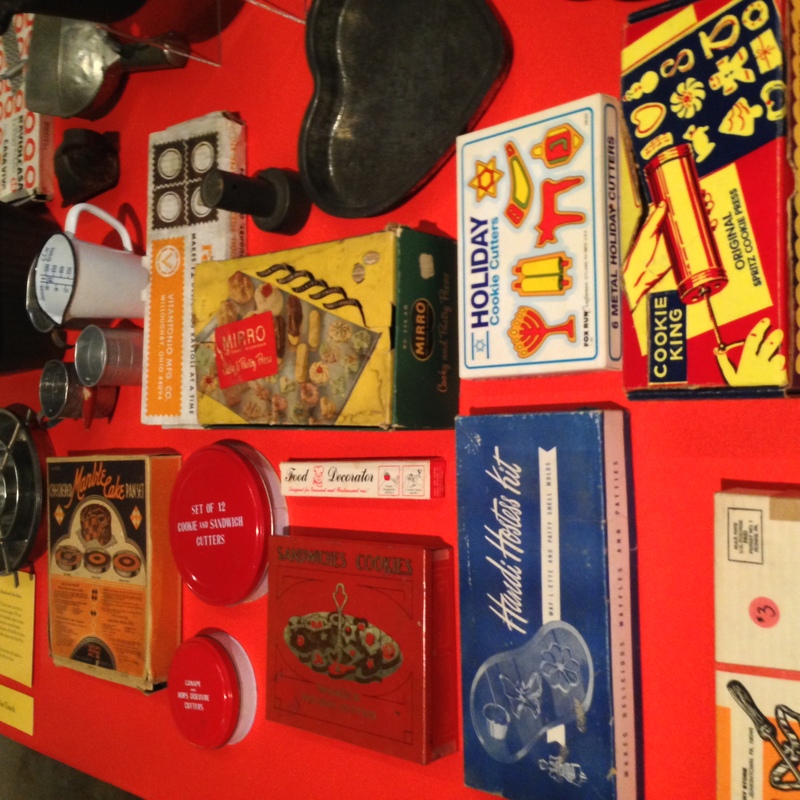 When you think of some of your fondest childhood memories, I’ve come to find that many surface from events that took place in the home, and more specifically, in the kitchen. 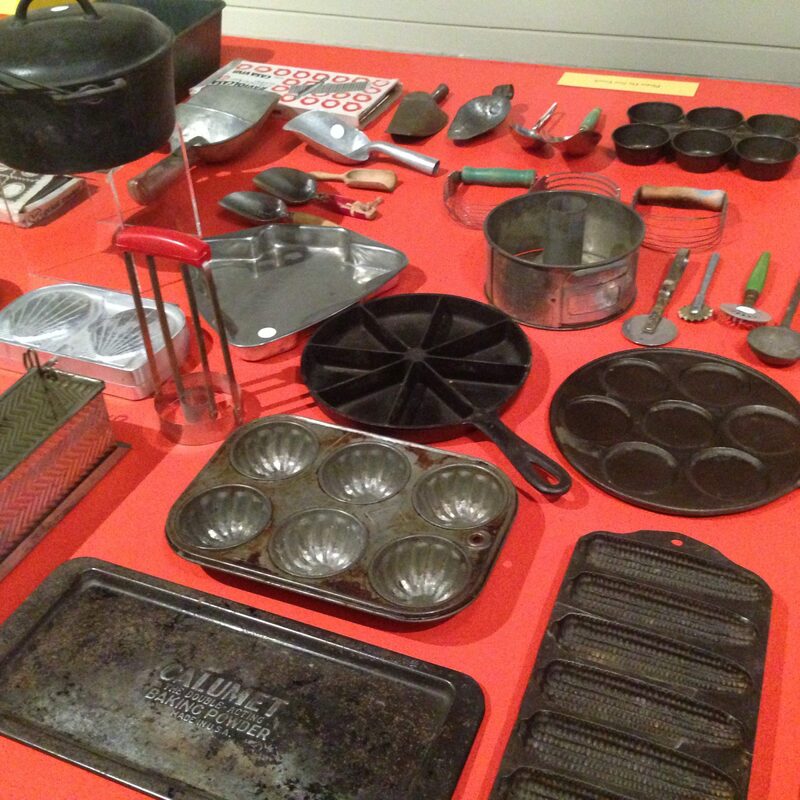 It is no surprise why this is so; the kitchen is a common gathering place for families, events, story-telling, holiday baking and tradition making. 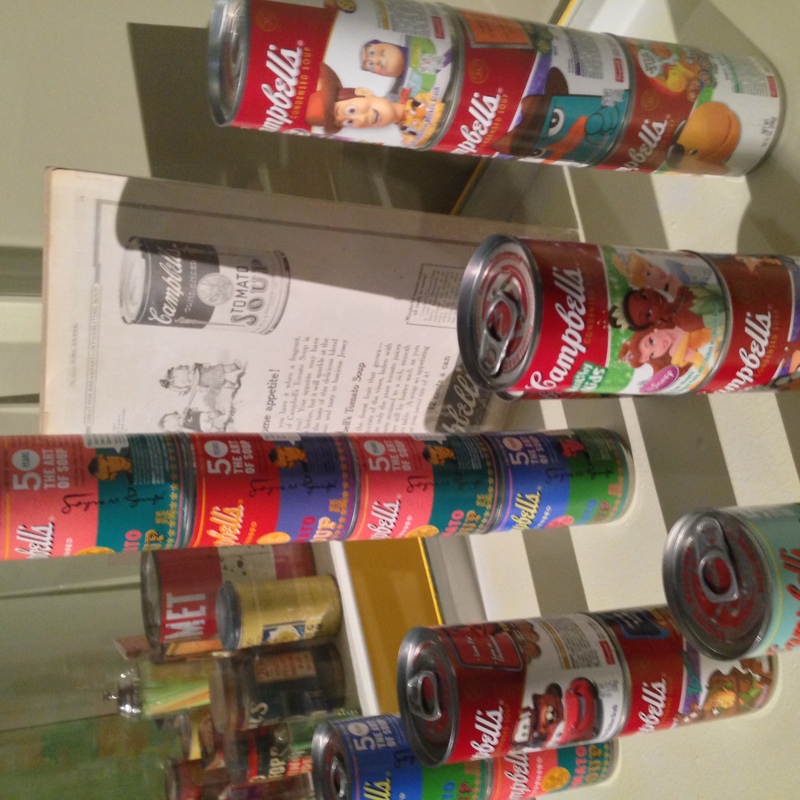 Aside from being a place to gather, it is a place of nourishment, not just for our appetites, but also for our souls. 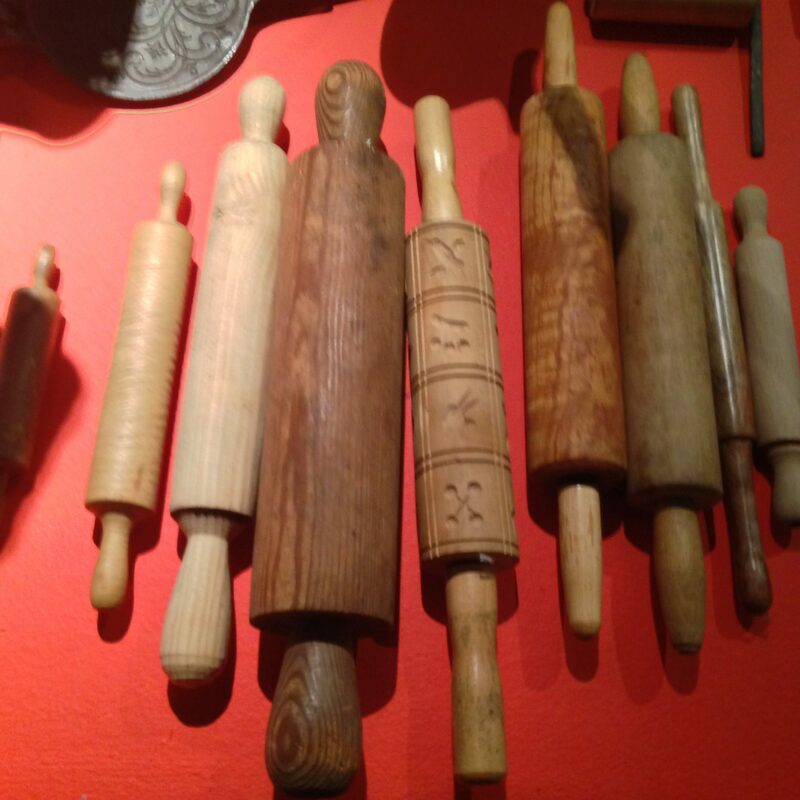 Looking back over the years where the art of culinary has changed, there is one thing that remains the same, we all continue to gather, create and nourish ourselves within the kitchen. 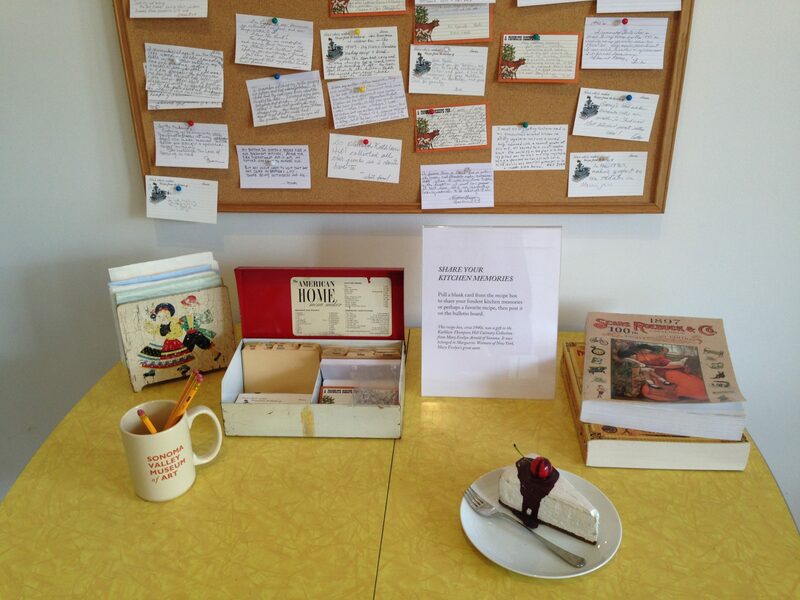 And that is the preciousness of memories, being able to relate to those you have not yet had and anticipating the future of those to come. 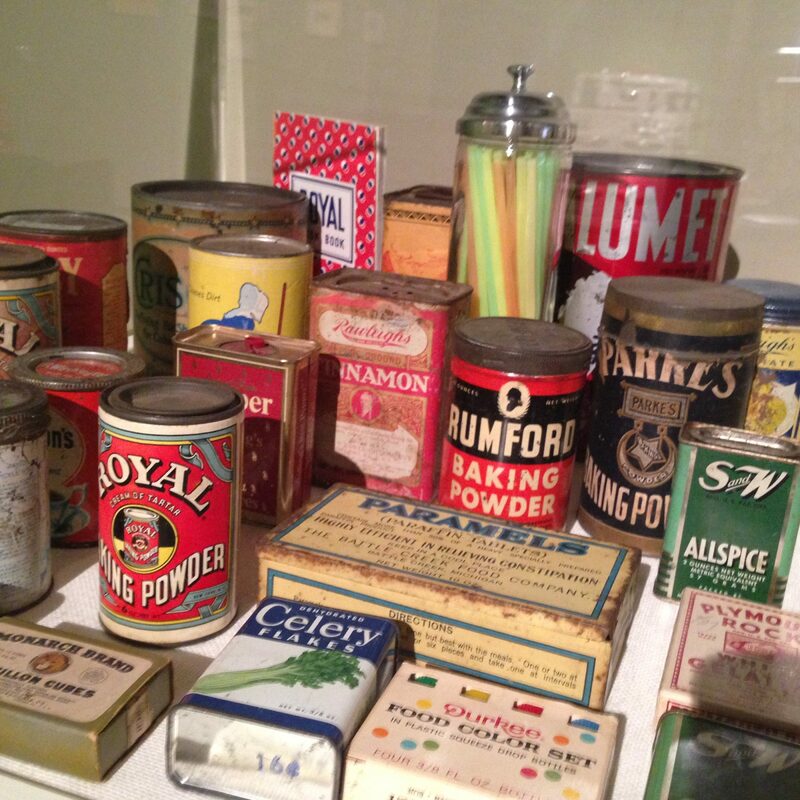 With this is mind, Kathleen Thompson Hill began her culinary collection that is now on display at the Sonoma Valley Museum of Art for all ages to experience and cherish. 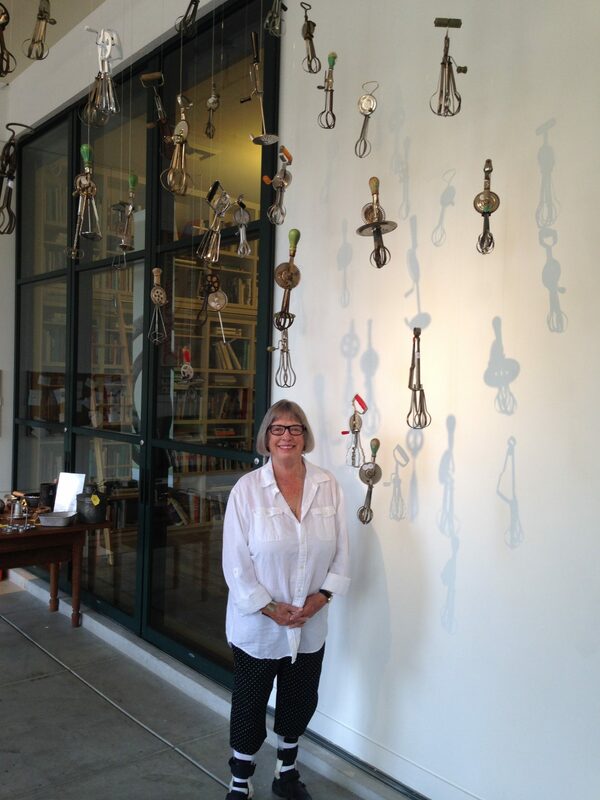 Kathleen’s collection began on a whim, when she found herself hunting for antiques and unique trinkets as gifts for her mother who was an artist and interior designer. 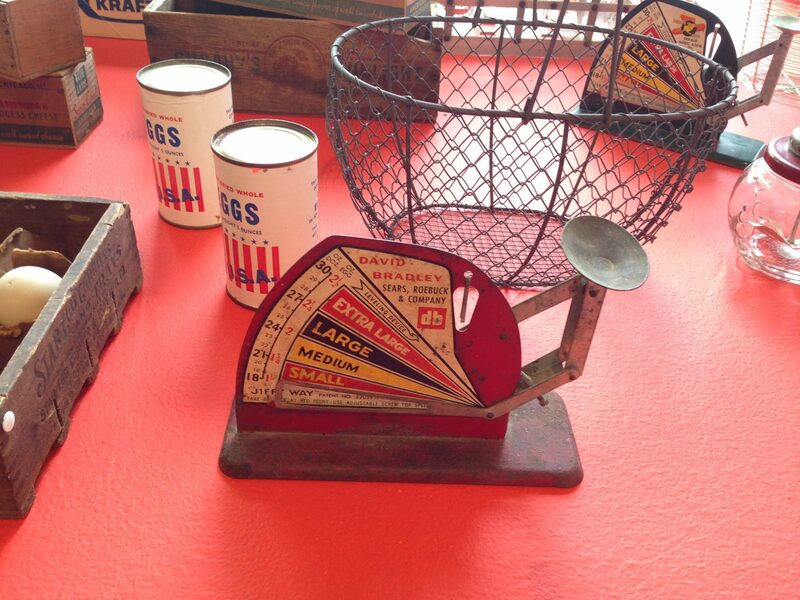 She began collecting more and more as she traveled and gave herself a strict $3 max price limit. 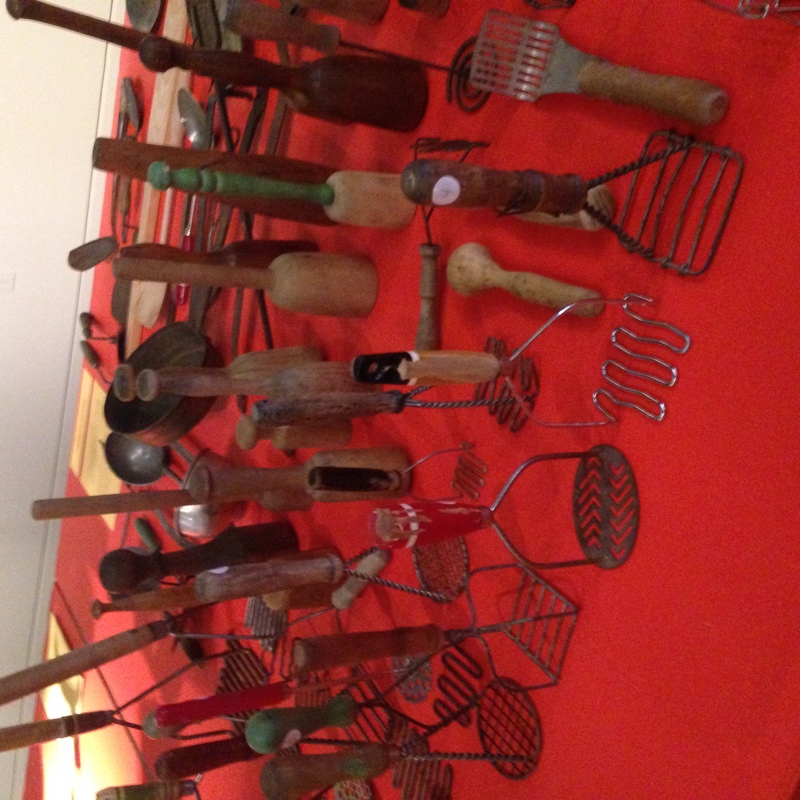 Kathleen’s love affair with kitchen keepsakes is more than just novelties; her collection shows how utensils reflect cultural, social, economic and agricultural events throughout time. 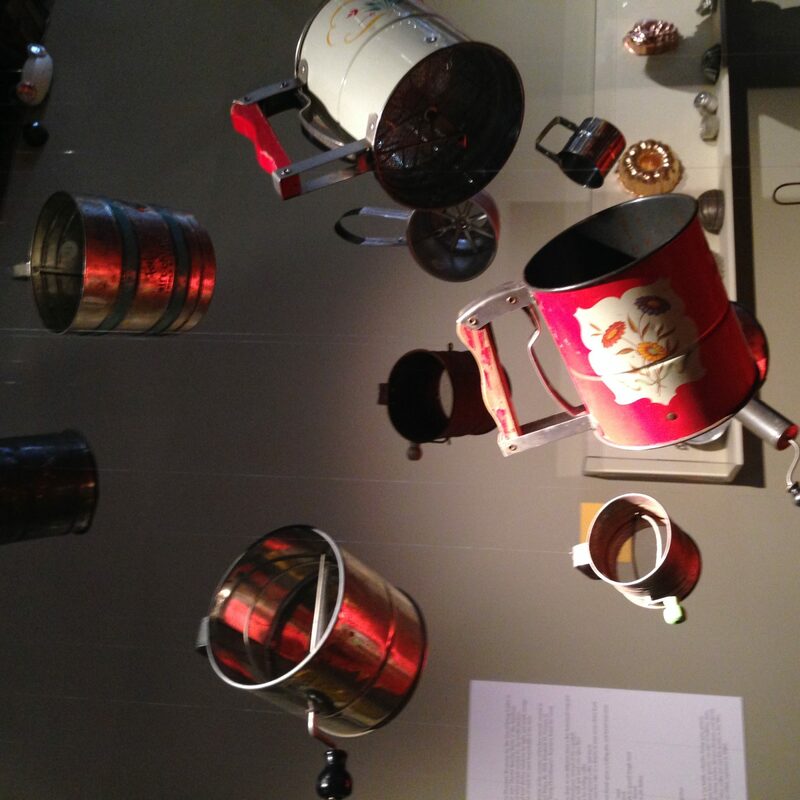 In addition to showcasing change, memories and functionality, her collection goes on to illuminate the marketing and advertising culture over the decades. 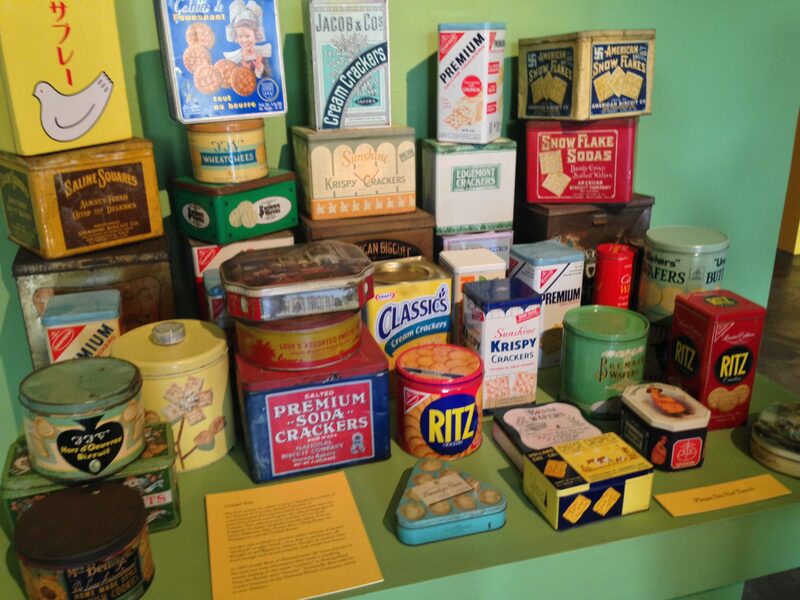 Cracker Tins – Dating back from the 1800s to the present, Kathleen’s collection includes 70 cracker tins from over fifteen countries, including: England, Scotland, Holland, Canada, Japan, France, Israel, Malaysia, Puerto Rico, Hong Kong, the Philippines, Italy and the United States. 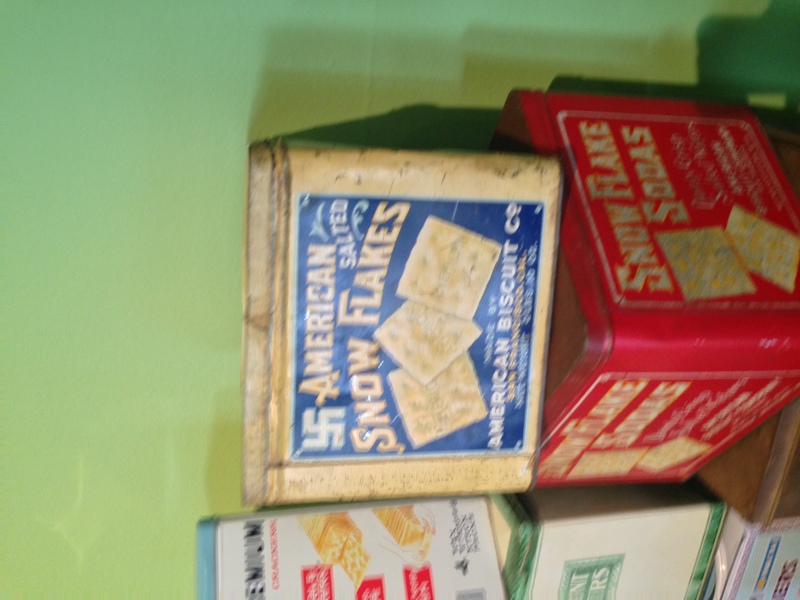 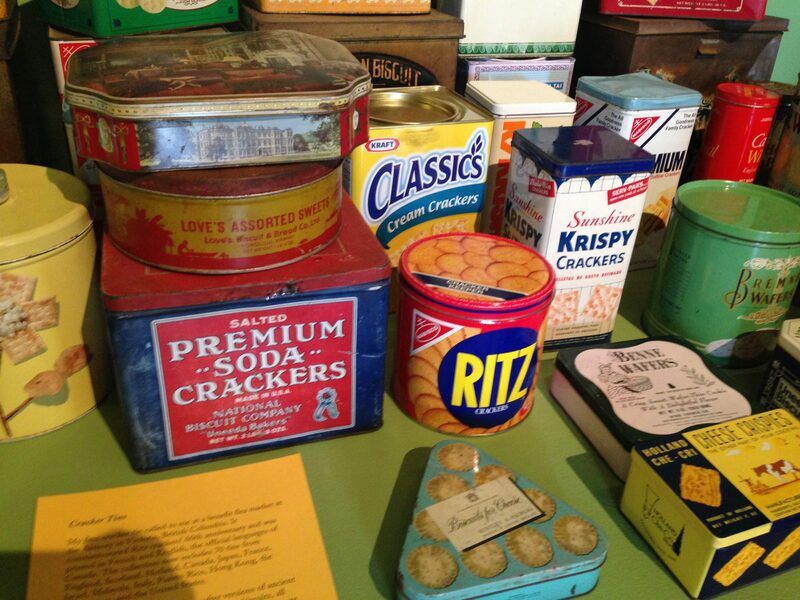 The evolution of cracker tins began in order to ship and preserve softer versions of biscuits overseas, allowing the results to yield what we now know as crackers. 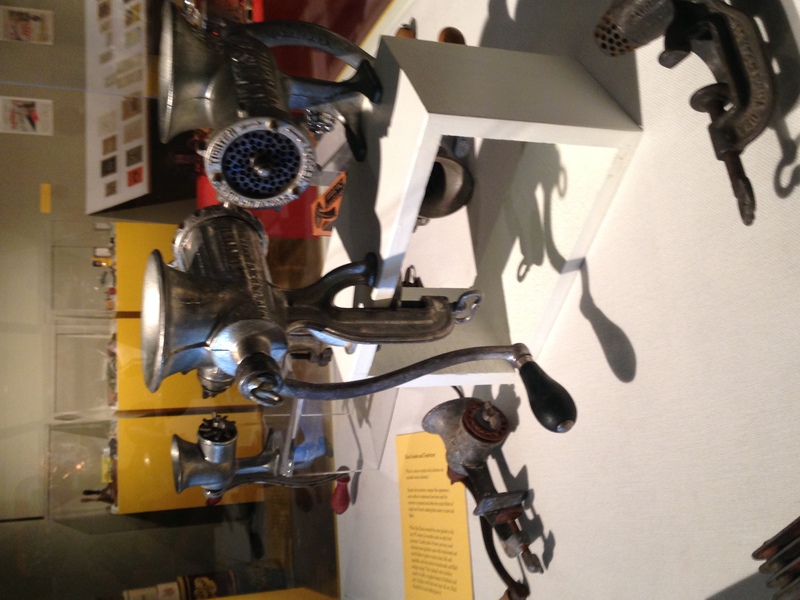 Meat Grinders – The meat grinder was originally invented in the late 19th century by Karl Drais. 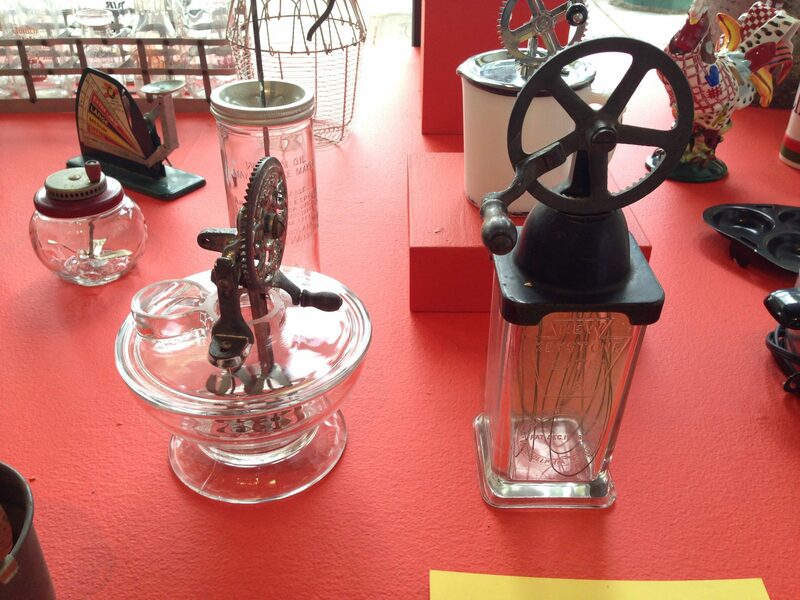 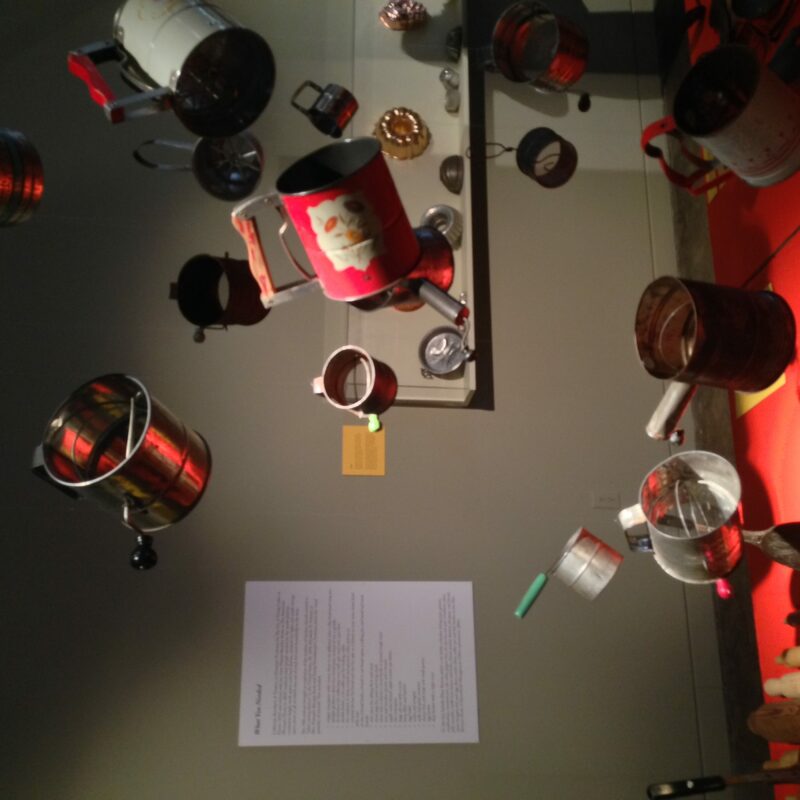 This collection includes grinders that date back to 1880, and are noted as being early versions of food processors. 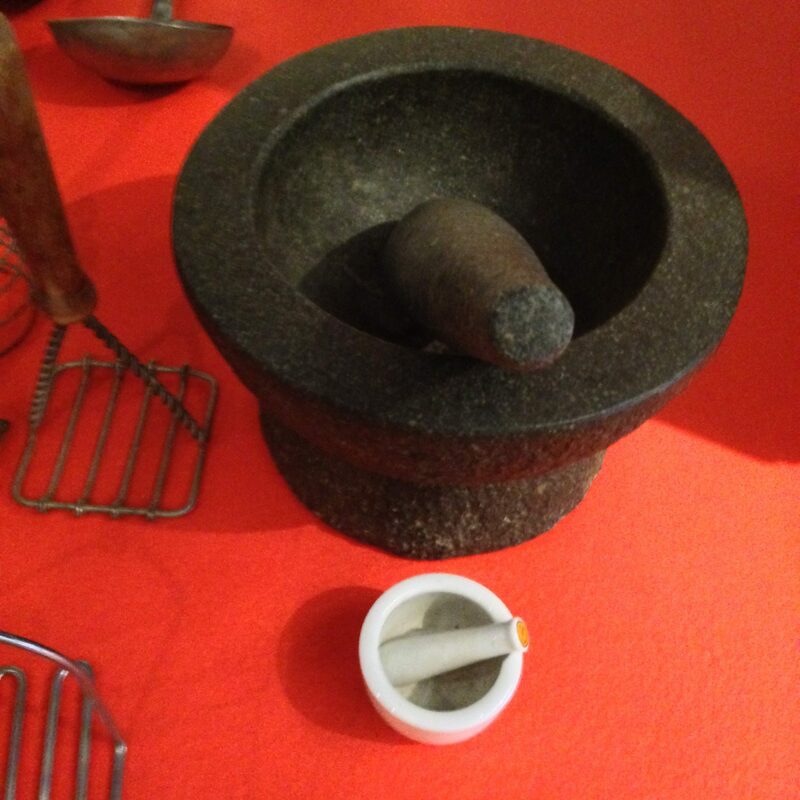 Pestles and Potato Mashers – The potato masher gets its roots from the English who started mashing potatoes back in the 1600s. 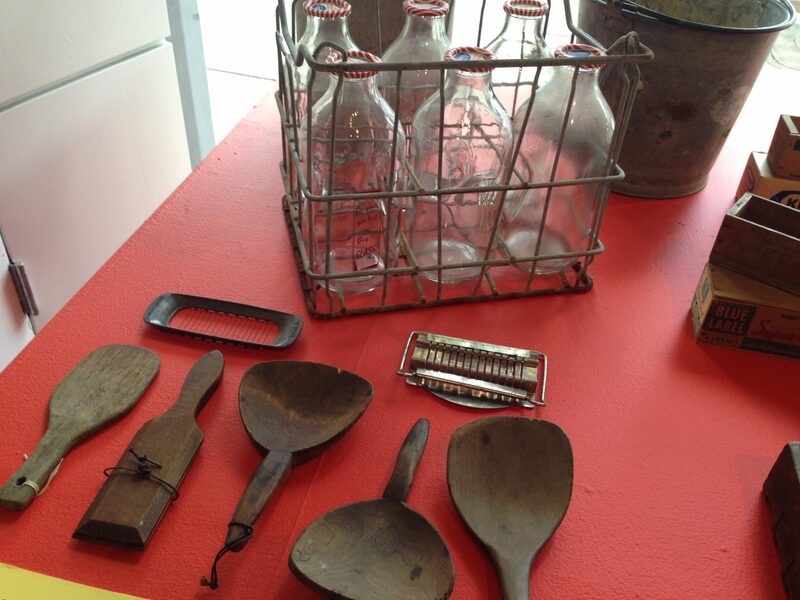 In 1847, Lee Copeman received the first patent for a potato masher, and ever since the gravy has been flowing. 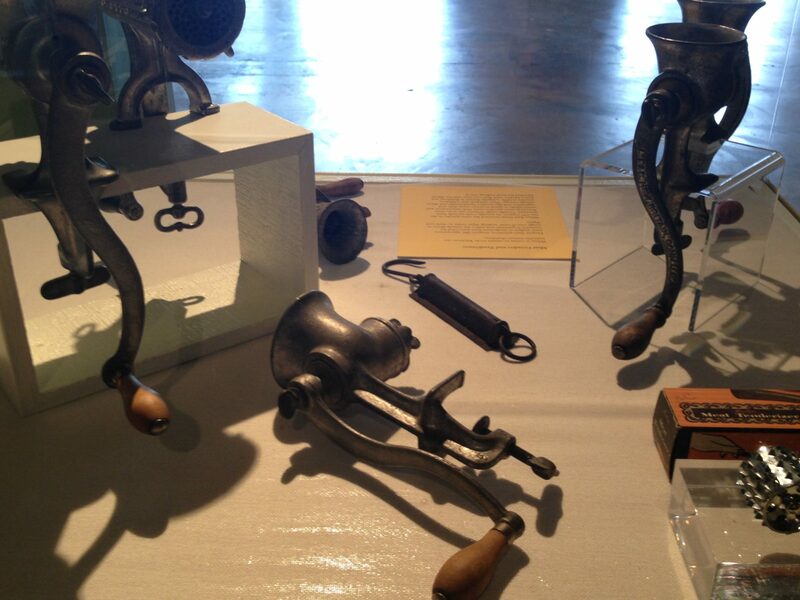 The exhibit features a wooden pestle from the early 1800s as well as mashers dating back to the 1880s. 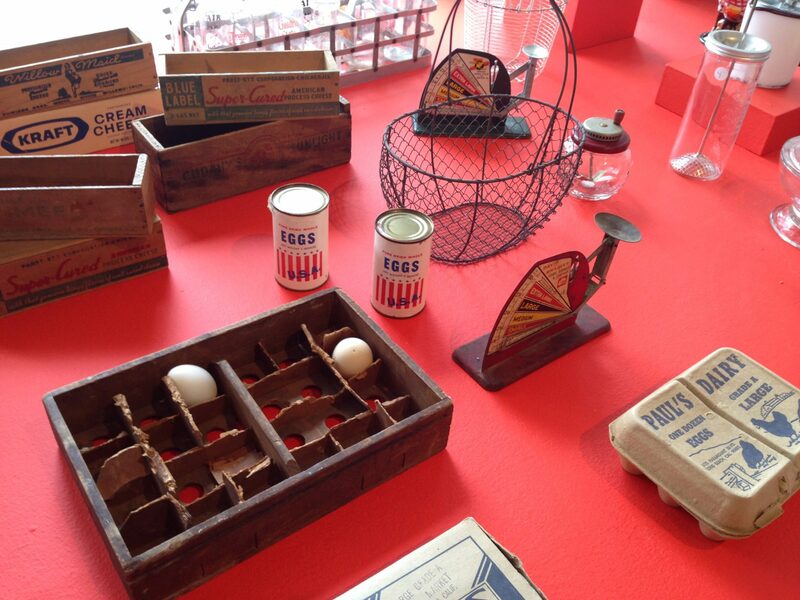 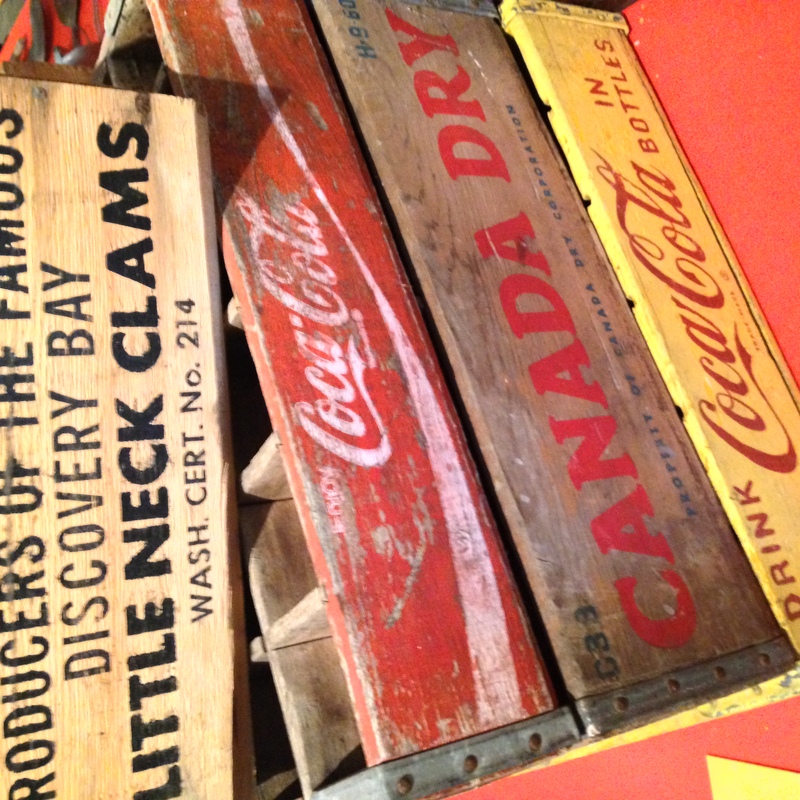 Sifters – This collection is displayed hanging as installation art and features sifters that date back to the 1920s. 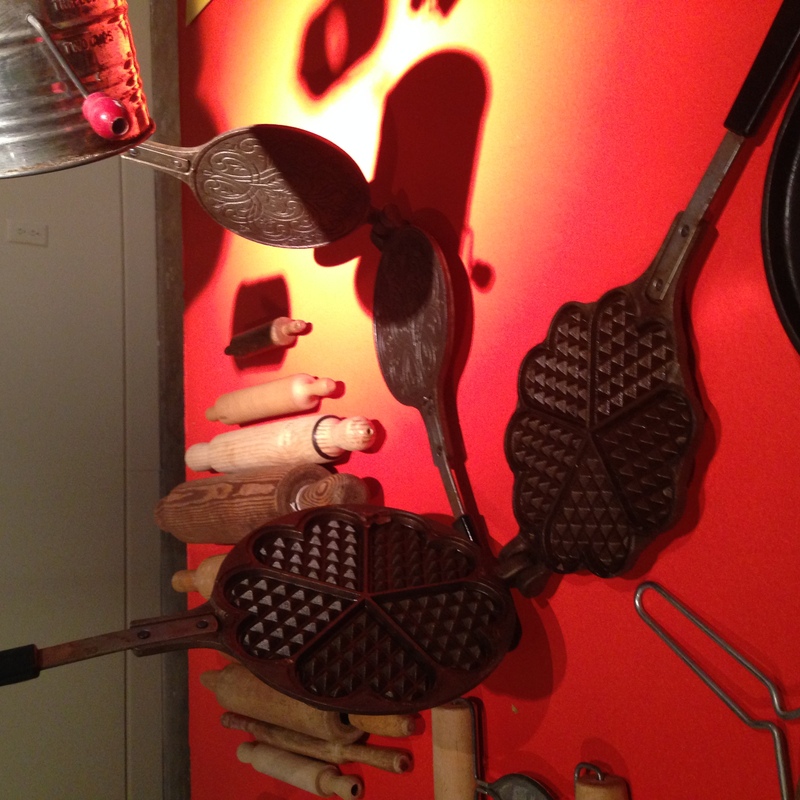 The Egg Beater – The egg beater revolutionized the kitchen, making hand beaten and whipped eggs a thing of the past. 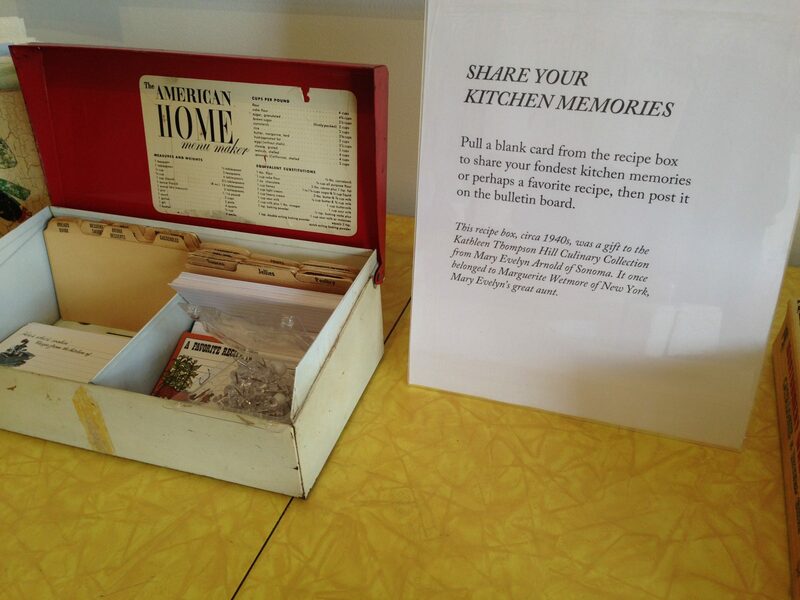 Sharing kitchen memories – The gallery includes an old-fashioned table and an antique recipe box where visitors can leave their favorite kitchen memory and explore those others have left. 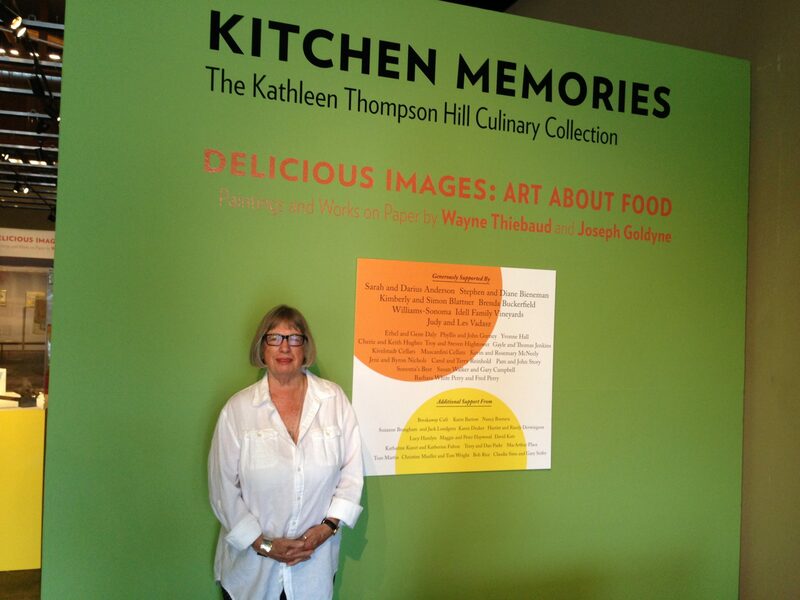 Kathleen’s Kitchen Memories can be purchased on her website and features recipes, photos and historical information regarding the collection. 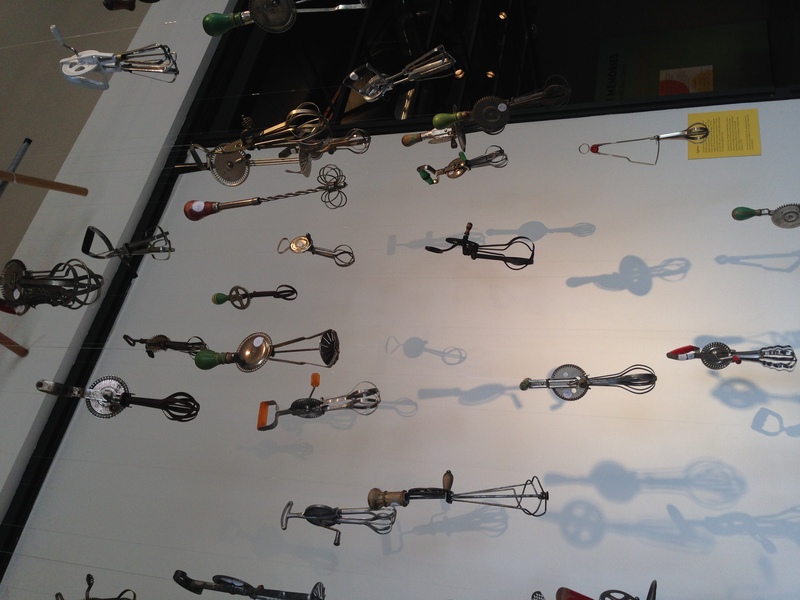 This entry was posted in Food, Lifestyle and tagged Culinary Collection, Kathleen Hill, Kitchen Memories, Sonoma Valley Museum of Art, SVMA by admin.